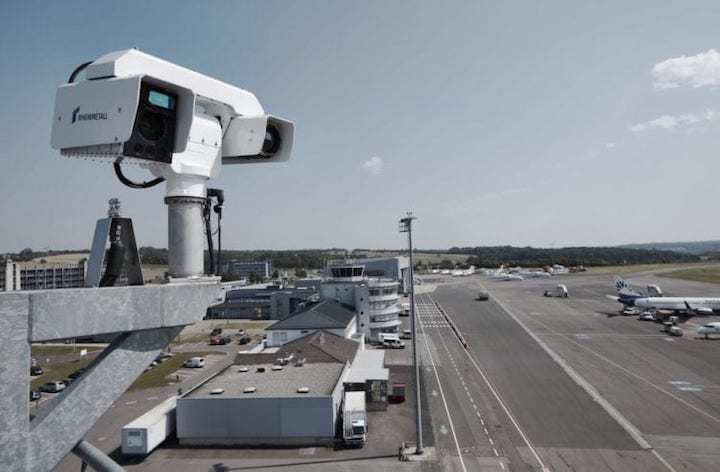 A camera capable of giving remotely located air traffic controllers a real-time view of airplanes landing and taking off at Saarbrücken Airport. Germany's air navigation service provider will launch remote tower technology with a four-week introductory phase followed by entry into service Jan. 4, 2019. Germany’s first landing and take off of airplanes monitored remotely by air traffic controllers occurred at Saarbrücken Airport on Dec. 4. Both aircraft, a Luxair Bombardier DHC 8400 arriving from Luxembourg and a CRJ-700 taking off en route to Berlin’s Tegel Airport were watched by controllers 280 miles away at Leipzig tower. "We have established a new standard in the world of remote tower technology,” said DFS Chief Executive Klaus-Dieter Scheurle. The remote tower technology was deployed by DFS Aerosense, a provider of remote air traffic solutions. DFS Aerosense was established under a March 2018 joint venture agreement between Austrian information systems provider Frequentis and Germany’s air navigation service provider (ANSP) DFS. A controller at Leipzig Airport uses this 10-screen layout to monitor air traffic at an airport 280 miles away. Photo, courtesy of DFS. Surveillance of the airport is provided by redundant optical technology that beams panoramic images of the entire airport surface to a row of monitors installed within controller working positions back in Leipzig. 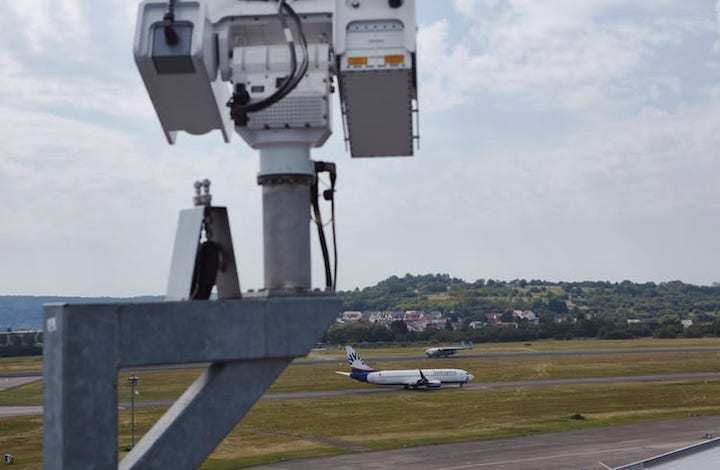 Infrared cameras automatically lock on to the trajectory of aircraft flying into and out of Saarbrücken, which handles about 15,000 flights annually, putting it at the lower scale of volume with an opportunity to evaluate the remote tower concept. The adoption of remote tower technology has expanded to more ANSPs globally, including in the United States. Northern Colorado Regional Airport became the second U.S. civilian airport facility to begin testing remote tower technology in October 2018. The test will evaluate the use of new high-definition cameras and a light signal gun capable of relaying a 360 degree view of the airfield to the control room. Leesburg Executive Airport in Virginia in 2017 became the first U.S. airport to work with the FAA and Saab Sensis to test the use of remote towers for pilots flying IFR and VFR flights. The airport is currently still evaluating the performance of the remote tower concept. Infrared camera installed at Saarbrücken to enable the remote tower concept. Germany’s first entrance into the remote air traffic surveillance era will bring 10 air traffic controllers from Saarbrücken to Leipzig. DFS also confirmed plans to transfer the control of Erfurt and Dresden airports to Leipzig's remote tower control center. 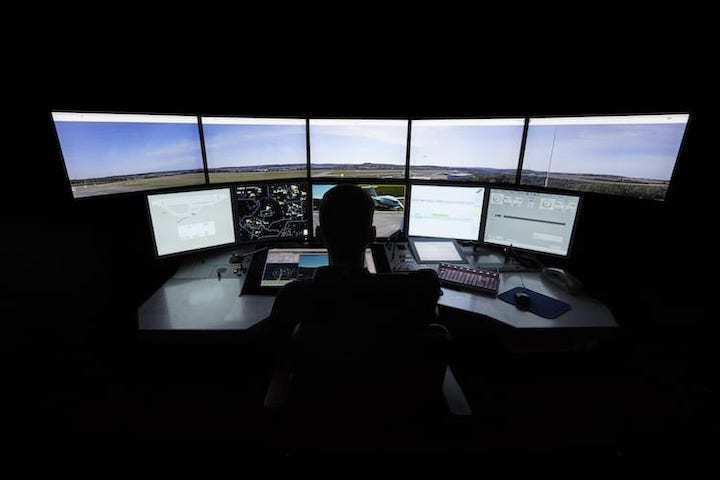 The plan is to have the Leipzig controllers monitor air traffic at all three airports. "Our system allows us for the first time to control a large international airport around the clock from one external location,” said Scheurle. Moving forward, the remote tower will undergo a four-week trial period before becoming officially integrated into German air traffic operations.